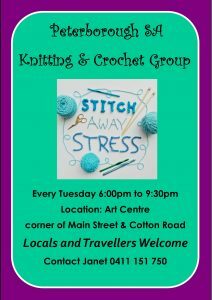 The Peterborough Knitting and Crocheting Group was formed in August 2017. We started with around 5 people and now have around 40 members. Not everyone comes at the same time but a lovely mix and an average of around 18. We meet at the Peterborough Regional Art Centre (on the Corner of Main St and Cotton Road) every Tuesday from 6-9pm. We have a Facebook page as well and people from outside the town actually get involved as well. The age of members ranges from 9 to 84 at the moment. It is a fun evening with a lot of chatter and laughter, as well as crafting. Our Mayor, Ruth Whittle has nicknamed us the ‘Nitters & Natters’ group as she pops in from time to time to say hi and have a cuppa. Topics are quite varied depending on the group mostly. There is a regular group that attends regardless of the weather. The group has turned into a fantastic social outlet for many of those who would be at home alone in the evenings. A birthday club has been formed which is a delight to those who attend. Everyone who can, or who remembers, brings along a bit of supper and a delightful evening is enjoyed by all. We come up with projects and members can be involved if they want to – it isn’t compulsory. All a bit of fun really and keeps people interested. We encourage travellers to come and have a cuppa and chat and do a bit of craft if they wish. A lovely break from the road and the van. Since the group started we have had a couple of tourists come in for the few hours and left quite exhilarated either by meeting new people or finding out a bit more of the area and its history. So if you are in Peterborough – come and say hi on a Tuesday. More than welcome. Moira on 0447 140 542 to discuss.